On the Myers-Briggs, Bonnie scores as an INFP – Introvert, Intuitive, Feeling, Perception – although as she grew older her scores shifted some to nearly 50/50 for I/E and P/J. She believes the change in score was related to experiences of trauma & loss (leading to more of a need for “control” of things…) and the intentional adaptation to talking to larger groups of people because of her career. She loved binge watching Parenthood, Frank & Gracie, The Crown, Orange is the New Black, and Gilmore Girls. Not to mention a few more serious shows like Hell on Wheels, Peaky Blinders, Breaking Bad, Blacklist, Once Upon a Time, Marco Polo…. variety is good! Now she’s on to Nurse Jackie – oh, yes!! Bonnie is melancholic by nature but loves to laugh. Much of her writings seem to come from that melancholic place. Themes from real life e.g. love, death, trauma, growth, maturing, and healing have repeatedly emerged. The creative endeavor of writing fiction, non-fiction and poetry started early one Spring morning in 2017 when Bonnie awoke from a dreadful dream, heart-pounding and thoroughly shaken. She felt absolutely compelled to write it down. She wrote herself a quick email with just descriptive words then, spent the morning getting ready for work, getting kids ready for school and being continually interrupted by the traumatic story that was demanding to be told. She felt nearly possessed with the need to keep writing the story. As of September 2017, that story, titled Dreamwork, has over 20,000 words! This in itself is amazing considering it was to be Bonnie’s first attempt at writing a long fictional story. As per the usual “alignment of the stars” or whatever you wish to call it, a mentor appeared in the form of a good friend who encouraged her to “keep writing” when she was wondering what the heck was going on. Bonnie’s been writing since that morning and interestingly, other stories have also emerged, along with this blog. Bonnie believes in the power of creativity to aid in the healing processes of grief. Whether it’s creating a living mosaic in a garden or bringing to life, for a child, a custom handmade “Waldorf” doll; she has always engaged in some form of creativity for pleasure or as a necessity to cope with life’s challenges and pain. Her own grief experiences have been a powerful influence in all of her creative endeavors. Bonnie started a Wattpad profile and posted a few short stories for fun. She hopes to “officially” publish a story or two, eventually. But, not until the time is right, and almost purely for the satisfaction of bringing her stories out to whoever finds interest in them. Oh, well yes, there IS more to it. The entire process of writing to publishing is a learning experience perfect for this time in Bonnie’s life. She’s energized by the learning process! 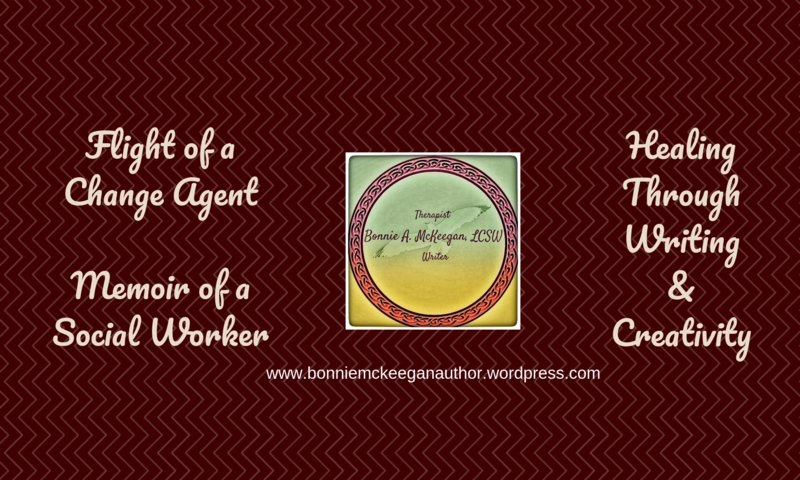 Essentially, the writing of fictional stories began for Bonnie with a dream. She has been writing in some form or another for years, from her personal teenage journals embellished with imagination to her Master’s Research Project bound for the shelf at California State University, Sacramento. The current creative endeavor seems just a natural evolution. Bonnie lives in Grass Valley, California with her ever-supportive husband & teen twin boys, two feline personalities, an energetic Mini-Aussie nicknamed “Roxie The Rocket,” and a small backyard chicken flock. The two elderly goldfish suffered a sad demise. Bonnie’s neighborhood hosts a multitude of wildlife including wild turkeys, deer, mountain lion, numerous birds, raccoons, skunks, gray and ground squirrels, fox, opossum, and black bears just to mention a few. She has a successful part-time private practice in Grass Valley where she supports clients during challenging times in their lives, often processing a range of grief & loss issues. She has a Master’s Degree in Social Work with experience in chemical dependency, mental health, and her primary passion – healthcare. Her approach is “whole person” acknowledging the physical, mental, emotional and spiritual aspects of life. Up to the middle of 3rd grade, homeschooling was the education of choice for her boys but, their involvement with the local school system was important to her as well. Bonnie’s volunteer time over the past few years has been connected to her boys’ education. She is proud to say she was one member in a passionate group of parents driven to start a new public charter school in El Dorado County and started the fundraising organization for that school, which is now thriving (American River Charter School). She was on the Yuba River Charter School’s Parent Council & was a board member of the YRCS Education Foundation, a non-profit school fundraising group. She was also on the Board of Directors and board secretary at Sierra Montessori Academy, a K-8 in Nevada County, California for two years. Bonnie enjoys gardening, yoga practice, nature walks, camping and other travel adventures, lake days, snow skiing, reading, eating, painting, sewing, crocheting, snorkeling, and spending time with close family and friends. And coffee, any flavor, softened with non-diary creamer. Bonnie’s favorite band is Fleetwood Mac. Their music conjures overwhelming feelings of joyful and melancholic nostalgia. Bonnie’s favorite place to relax is at the ocean or beside a campfire. If Bonnie could hire any professional it would be a personal chef! Outdoor Life Hunting & Gathering Survival Manual: 221 Primitive & Wilderness Survival Skills. and board games. Chinese Checkers is a favorite as well as Backgammon. Bonnie’s greatest gardening nemesis: The thirsty grapevine leaf-hoppers & hungry sphinx caterpillars who munch her one and only grapevine with great enthusiasm every year. Bonnie’s greatest health challenge is riding the often torrential waves of chronic migraine. Living with chronic pain is difficult, to say the least, but she never gives up. She has found ways to keep going, embraced lessons learned through the process, and hopes to provide encouragement to others who live with chronic pain. If Bonnie could add one room to her house it would be spacious enough to hold all the books, sewing and crafting materials that are currently spread throughout the house. Bonnie’s greatest joy: Her and her husband’s twin boys who continue to inspire her in many extraordinary ways! Bonnie thanks you for visiting! Lovely to meet you Bonnie. Best wishes with your book. So nice to meet you as well! Thank you for visiting and the follow. I am enjoying your book! Hi! I nominated you for the Awesome Blogger Award! Thank you for visiting! Laughing about the chef because I am past even wanting to be taught… I just want someone else to do it 😉 Would rather be doing so many other things! LOL. Seems to me you are using your psychology knowledge in your writing… it was a long road to get here, yes, still traveling, and this week I started writing about that road (or what I call My Flight to Private Practice). Maybe it’ll manifest into my first memoir 🙂 Thank you and I look forward to more of your writing! Wow!! Terrific about page, Bonnie!! 😀 I love how you write you were compelled to write your current WIP and congratulations on you 20,000 – no mean feat!! 😀 Your sense of energy and passion for writing and life emanates through this post…your wisdom and sense of calm is equally evident. It’s a real joy meeting you here. ❤️ BTW I’ve watched so many of the series you mention…I can’t wait for the new The Crown and new series of Orange is the New Black must surely soon be out. I have not tried Nurse Jackie…might have to give that a go! ah, the Crown! Yes, that was another one I loved! Alternating between Jackie and Blacklist this week. Yep, Blacklist, a ridiculous but addictive (not for everyone!) dark show ;-). Anxiously awaking Orange too!